There are a surprising number of athletes at all levels that are training and competing with minor injuries that they ignore most of the time. Sometimes however, injury will get the better of you, whether it is a crash that results in road rash or a broken bone, or an overuse injury that comes from pushing your limits in training. As a racing cyclist I deal with road rash most seasons (I remember racing on the hottest day of the year with full arm and leg sleeves to prevent my newest scars from getting sunburned!) Injury time off can be a frustrating hiccup, especially in the summer high point of the season. We know that the best athletes live right on that edge between getting sick and injured, and being able to recover and get faster and stronger. One athlete I work with is dealing with an overuse injury right now as the result of pushing himself harder when moving from the regional to the national level. While it may be possible to be competitive at a higher level, as with anything there is a learning curve and an increased demand, and you might find an injury or illness sneaks up on you. 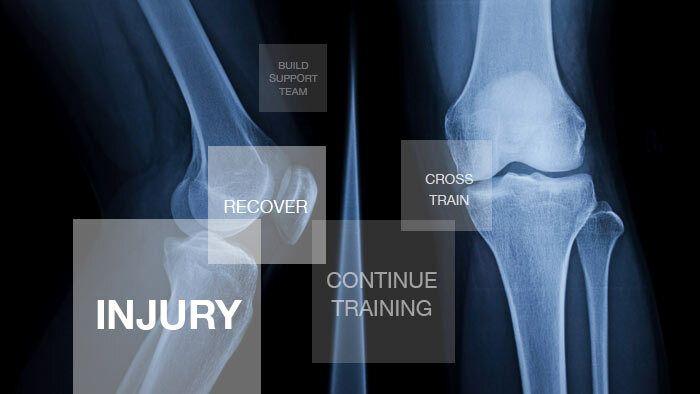 Whether you have a broken bone from a crash, or an overuse injury, it likely that you are going to want to recover as fast as possible and get back to full health and continue competing. However, the most important consideration is long term health and competitive potential. After all, what is six weeks off in a 40 year racing career? This article will address the balancing act of returning to training and competition as quickly as possible, while maximizing the opportunity for long term resilience. When you get an injury, the positive athlete in many of us will imagine that we can get back on the wagon right away and not miss a beat. It pays to be brutally honest with the timeline to recovery (you can always exceed expectations). I have an athlete that had one injury that probably led to others. With repetitive movements (like all the endurance sports we do, especially on the bike), one injury can cause others. If, for example, you start getting tight hips or hamstrings, that can begin to affect the lower back. I have often seen symptoms bounce back and forth across the body – from left ankle to right knee to left hip to right shoulder. Cyclists in the Tour de France get regular massages to help with recovery, but I also believe one of the biggest benefits of that massage is keeping the body in balance. As an NCAA track and field athlete, I had to deal with an unknown knee injury. I ended up doing pool running, cycling, core work, stretching, ultrasounds, self massage, and the process still took a full four months before I could run again. The upside was that I was able to go into the next base building period with as much strength and fitness as the rest of the team. We lose fitness roughly twice as fast as we get it back – what can you do during your injury time to maintain aerobic fitness? One consideration is to try doing other sports or different movements than you would normally do. For example if you can not get out on the bike, work on your core strength; if you can’t pound the pavement, try some swimming. Chris McDougall, author of Born to Run and Natural Born Heroes, argues for doing new movements daily as a means of injury prevention; start the habit while you recover. This is the perfect time to build you support team of health advisors. Injury time is a perfect opportunity to build/reestablish relationships to a doctor, physical therapist (PT), chiropractor, yoga instructor, massage therapist, acupuncturist, bike fitter, etc., who will be your guides to health. Keep up these relationships while fit, and you can keep your body running at full speed. It can be fun learning the right PT movements, yoga poses, and stretches that balance or undo to forces you have been putting on your body. The fit of your gear, like the proper shoes or bike fit, and the way you move (do you take advantage of stored energy when running, do your knees track properly?) affect performance and injury resistance, and injury time is perfect for tuning up your form. Most leg length discrepancies are functional rather than skeletal. You can improve skeletal alignment through yoga, chiropractic work, or rolfing, which can then in turn help muscles be more efficient. A good PT will be able to tell you which muscles in a group are weak, and which ones you should work on strengthening. Muscle imbalances can be an indicator of poor fit – which muscles have become overdeveloped to compensate? Theoretically if you strengthen the weak link (like the calf muscle) then you could transmit more energy into going forward. Make sure you don’t jump back into your training full force right away. Don’t fall into the trap of feeling extra rested and go out and put down the same hard effort. If you have been weeks off the bike/off the run, then your connective tissues will likely be in for a bit of a surprise when you start putting in the hard work. Just like the beginning of the season when you are building your base and adapting from the offseason, you need to prepare your body for the harder efforts to come. If your normal ride length was three hours before your injury, starting back with half an hour is not unreasonable. You can bump up the duration and intensity as you progress back to full strength. Allow yourself 24-48 hours time to feel the effects of increased training load. Just like Delayed Onset Muscle Soreness (DOMS), there can be a delayed response to injury. This might mean adding ten minutes back each day until after three weeks you can train at a normal volume. Only then do you want to start adding back the more focused efforts of intervals and hills. The hidden benefit of an injury is that it provides you with a mid season rest that others will not take. For cyclists who race road in the summer and cross in the fall, or runners who train and race year round, there is big potential to have a competitive advantage in late season races when others are tired. As example, we are seeing in this year’s Tour de France that Richie Porte, who crashed out of the earlier Giro D’talia is one of the strongest riders in the race. Many cyclocross racers take a long break in the summer to stay fresh for the long fall season. Gratitude is a huge part of enjoyment of a sport and an injury allows you to reset your gratitude –o- meter. Each stride, each pedal stroke in an opportunity to appreciate your current level of movement. Acknowledge you are not going to be as fit as your were before the injury. Put yourself in the beginner’s mindset. You can say to yourself, “I don’t how I will feel today, and I’m learning how to get fit again”. Training becomes simply a matter of testing yourself, just as you would at the peak of your fitness. Psychologically, you might feel some guilt for not getting out and training hard every day like you can when you are fully fit (this was a problem I had for many years). To avoid a negative spiral of emotions, just realize that getting injured is probably going to happen, and the way you come through it will shape your career. Nearly 100 percent of cyclists (and many runners) get injured with some sort of road rash or repetitive injury throughout the season. Injury time is a great time to do some planning and mental toughness training. We get mental toughness from completing hard workouts, and also from training when we are below our best. The book In Pursuit of Excellence by Terry Orlick is a great resource for working on your mental game. Focusing on positive visualizations of how smoothly and quickly your recovery will go, can be a big benefit. You can take advantage of the free time to assess your overall nutrition, mental fitness, equipment maintenance, catch up on sleep, catch up with relationships you have been neglecting, and go try something new! The first step is not to panic! If you have been an athlete in your sport for a few years, you will be surprised at how quickly you will bounce back into shape. I have heard the old pros tell me that, “all it takes is three weeks of riding six hours a day and you will be ready to ride a stage race”. I have experienced this myself. After a couple weeks of training where I feel like I don’t even know my own body- one day everything clicks and I feel like a real athlete again. This is a reminder of the resilience of the body and how special it is to be fit. Coming back to our overall objective of maximizing the cumulative longevity as a competitive athlete, any time there is a twinge of pain with an injury or you feel that you are pushing things too hard, it is OK to back off. You wouldn’t try to force your friend who caught the bird flu to go train hard with you until he was feeling better, you have to apply the same reasoning to your own injured body.